Killing yourself should be easy, right? Pop a few sleeping pills, lie on a railway track and let the train do the rest of the work. Neat, swift, painless. Yet dramatic. What could possibly go wrong with Jeevan Raikar's plan? Well, this: a girls' night out happening at the graveyard next door, starring a vodka-swilling blackmailer and her dead mother. And so, Jeevan - who ought to be dead by now, mind you - is stuck with bubbly Mia, raging Tanya and sensuous Alisha. Which might seem like an enviable situation to be in, but for one tiny catch. They are all the same person. Me, Mia, Multiple is a debut that cares little for convention: a romance with a twist, a twisted romance, a romantic twister. Whatever you want to call it, you'll tear through it with sheer pleasure. Title of the book plays a major role to hook the attention of the reader. 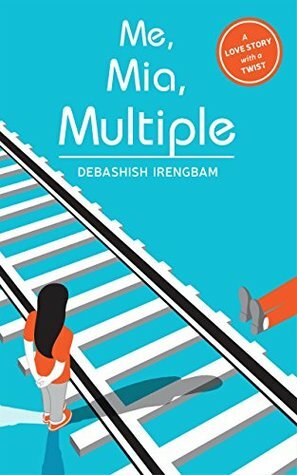 ‘Me, Mia, Multiple’ by Debashish Irengbam was one of the titles that forced me to pick the book as early as possible. I was really excited to flip through the pages and that excitement really paid off. The book is about Jeevan Raikar who got introduced in the story as being rescued from a Suicide attempt but stay patient; the book is not a boring drama of a suicidal person but is a very hilarious read (Overall, not the whole book). Soon after the rescue thing, Jeevan meets a girl named Mia D’Costa and then begins the real twister and fast paced, unexpected life journey of Jeevan. The book talks about various things but never stops over an issue for longer. Flash Backs and the mystery of girl, makes the reader to go through the pages quickly as everyone is curious to know where the story will end and believe me, the author justifies the end in pretty unexpected way and takes the whole read of the book to the another level. The story of the book is pretty fast and never leaves the central theme. It keeps you on toes till the very end, and finally with the climax you’ll be bound to bow down in front of the author for creating this masterpiece. The mystic background of the characters always makes you anticipate the story and that’s where the author wins over the heart of reader. Overall, it would suggest you to please do a favor on yourself and pick the book right now. Order the book by following the link.